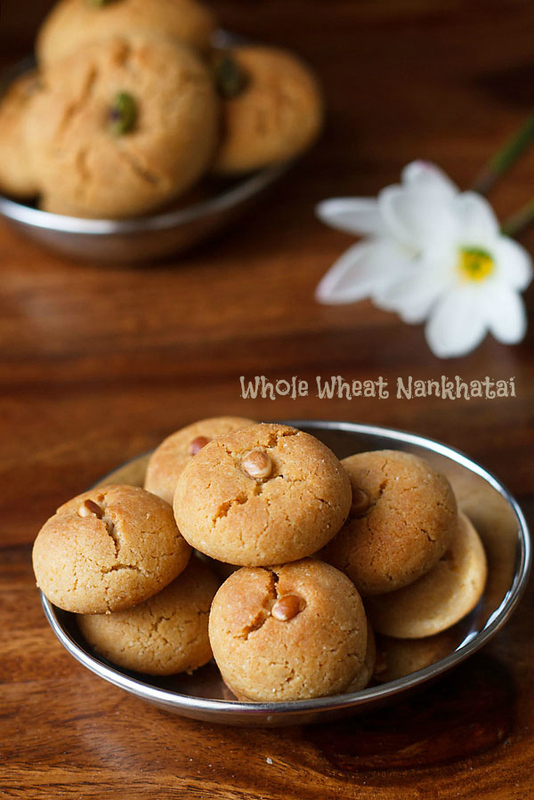 Whole wheat nankhatai recipe with step by step photos. 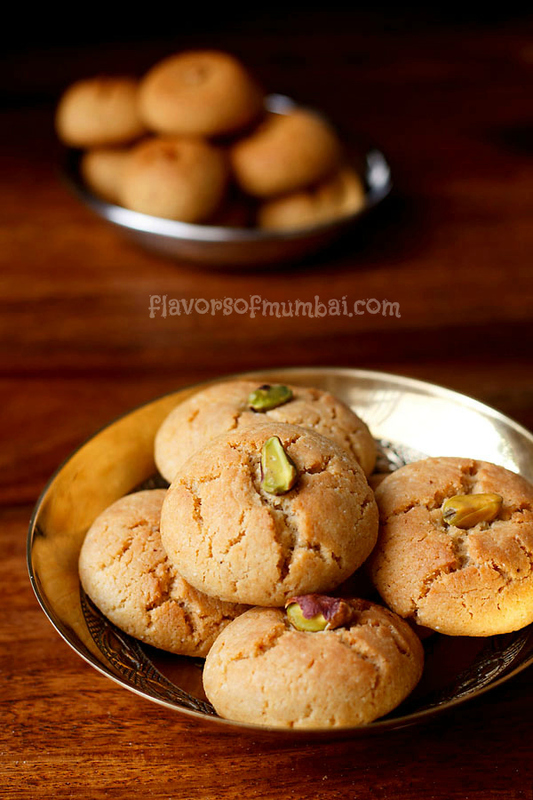 Nankhatai are Indian style cookies made with flour, ghee, sugar and cardamom powder. 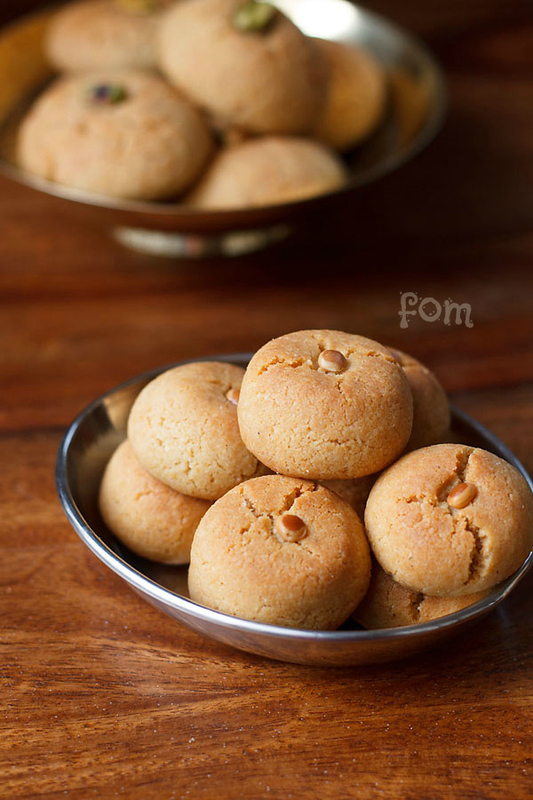 I have used whole wheat flour for this nankhatai recipe which is a healthier version. I love all kind of nankhatai you get in India like chocolate nankhatai, paper nankhatai and plain nankhatais. These cookies just melt in your mouth, tempting you to eat more! 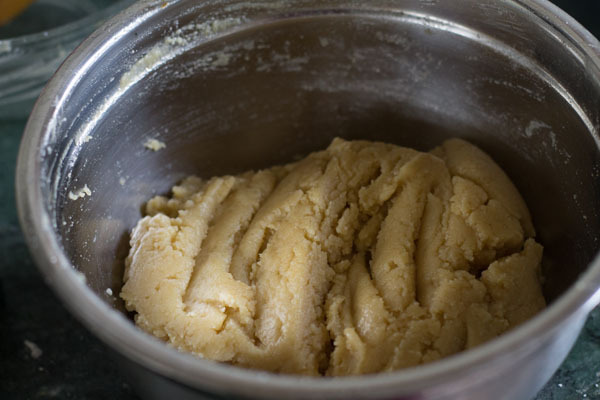 I have used ghee which is a traditional way of making nankhatais. But you could make with butter also. 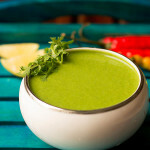 I wouldn’t recommend oil as it will not produce the same effect as butter or ghee would do. Adding nuts are optional i have used charoli and pistachios for garnish. Adapted this recipe from my easy nankhatai recipe. Sift 1 cup whole wheat flour, 2 tablespoon of gram flour, 1 tablespoon of rice flour, 1/4 teaspoon baking soda and a pinch of salt. 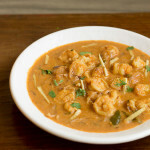 Also add 2 tablespoon of rawa. Mix all nicely and place the dry ingredients aside. 2. In another vessel take 7 tablespoon of powdered sugar. 3. Pour ghee over the powdered sugar. 4. 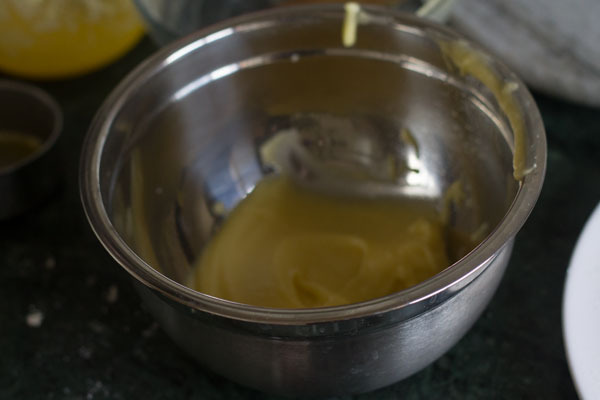 Cream ghee and sugar until they appear soft, smooth and fluffy. 5. Add 2 tablespoon of yogurt. 6. Whisk nicely with a wired whisk. The yogurt should mix nicely, the mixture should look smooth. 7. 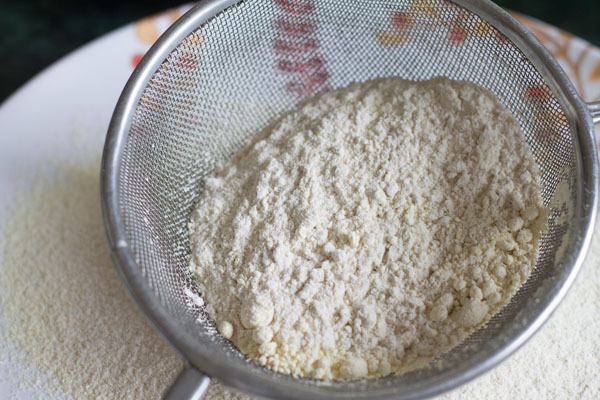 Fold the sifted dry ingredients into the wet ingredient’s with a spatula. 8. Bring the cookie dough together. 9. 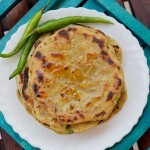 Sprinkle 1/4 teaspoon of cardamom powder and place the dough aside for 10 mins. Cover with a damp cloth or cling film. 11. Make marble sized balls from the dough. Gently flatten them with your palm. Garnish with charoli or pistachios. Alternatively you could use cookie moulds to shape them. 12. Place the cookies in a greased pan, in a preheated oven for 10 mins at 200ºC before baking. 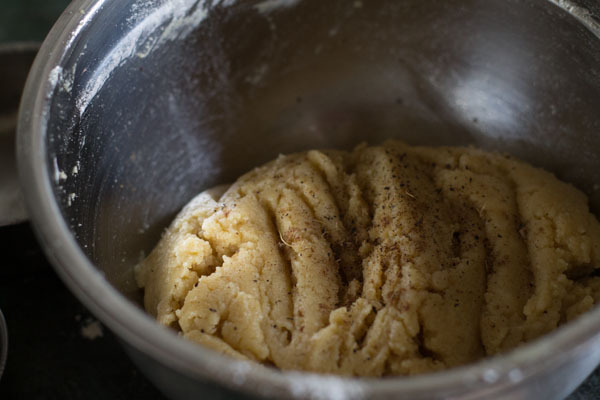 Bake at 170 ºC for 16-18 mins or until the edges turn light brown. If they are not baked don’t worry keep for some more time but don’t over bake them. As once they cool they would firm up so be vigilant and careful. 13. Repeat the same with the rest of cookies. Allow them to cool and then store them into an air-tight container or bottles. If you are looking for more eggless cookies then do check eggless shrewsbury cookie and eggless double chocolate cookie. 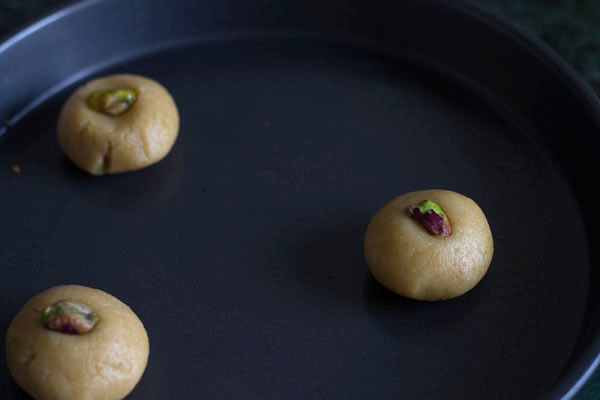 Whole wheat nankhatai recipe with step by step photos. 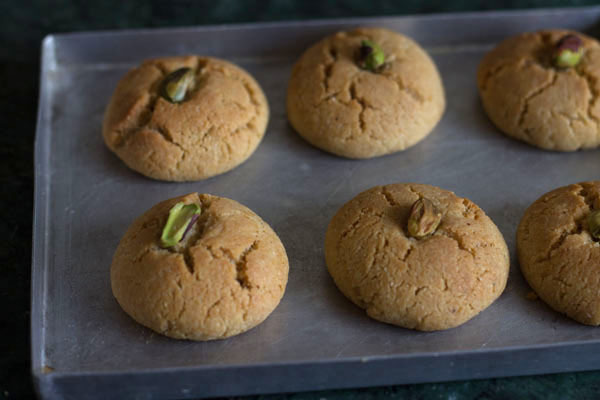 Nankhatai are Indian style cookies made with flour, ghee, sugar and cardamom powder. Sift 1 cup whole wheat flour, 2 tablespoon of gram flour, 1 tablespoon of rice flour, ¼ teaspoon baking soda and a pinch of salt. 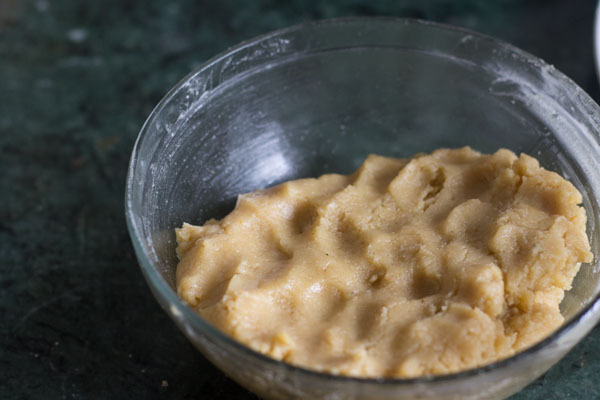 Also add 2 tablespoon of rawa. Mix all nicely and place the dry ingredients aside. In another vessel take 7 tablespoon of powdered sugar. 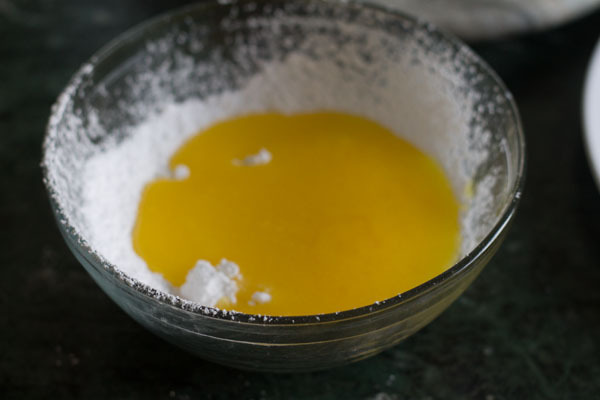 Pour ghee over the powdered sugar. 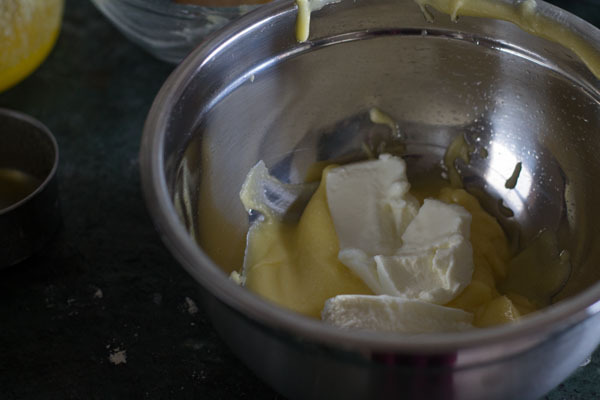 Cream ghee and sugar until they appear soft, smooth and fluffy. Add 2 tablespoon of yogurt. 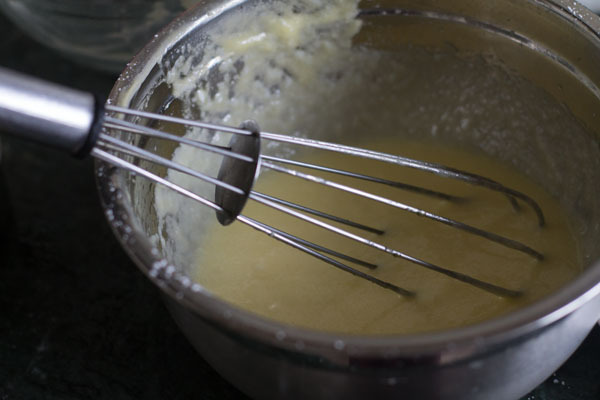 Whisk nicely with a wired whisk. The yogurt should blend nicely in the mixture. 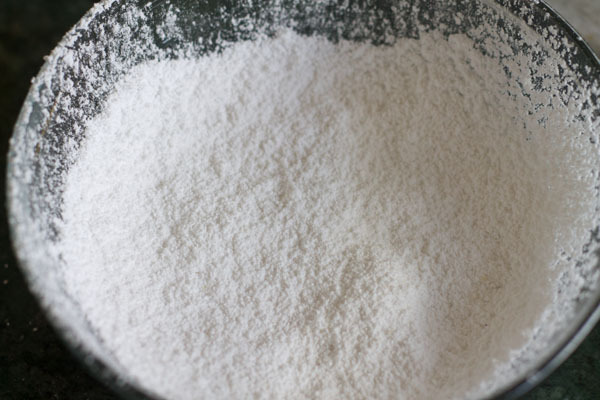 Fold the sifted dry ingredients into the wet ingredient's with a spatula. Bring the cookie dough together. 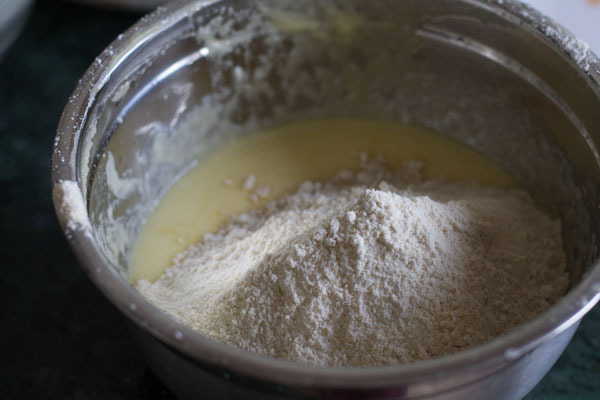 Sprinkle ¼ teaspoon of cardamom powder and place the dough aside for 10 mins. Cover with a damp cloth. Make marble sized balls from the dough. Gently flatten them with your palm. Garnish with charoli or pistachios. Alternatively you could use cookie moulds to shape them. Place the cookies in a greased pan, in a preheated oven for 10 mins at 200ºC before baking. Bake at 170 ºC for 16-18 mins or until the edges turn light brown. If they are not baked don’t worry keep for some more time but don’t over bake them. As once they cool they would firm up so be vigilant and careful. 1. Don't over-bake the nankhatais. Thanks Vicky for positive views. Hi Maria, can we use milk instead of yogurt? Sheetal milk and yogurt have different texture and properties. You can try using milk and let me know how it turns out? Hi Maria.. followed your recipes and it came out perfect. thank you for this. Pleased to know your feedback Nivedita, thanks for positive views. Totally love this!! Pinned for sure! Hi Maria, These nankhatais look absolutely mouthwatering 🙂 Love the fact that they are made of whole wheat! Sure Anugya I will, thanks for the invite and positive feedback. Thank you for your recipe, my batch of cookies turned out really great. A lot of commendation from the family hahaha I’m glad. Very pleased to know this Ani 🙂 wishing you a bright new year. Thanks for positive views. Hey Maria they came out so good. And Very tasty ?. Loved it. I wish I could send you some . Thank you so much for the recipe. 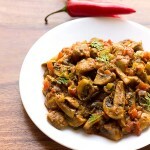 Hey dear awesome chef thank you so much for sharing this recipe ??. I can’t have my tea without biscuits besides knowing they r not healthy ☹️️. So I m going to make this healthy cookies and enjoy with tea and in between ;). 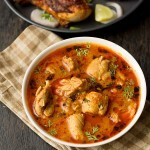 Your recipes r so good and simple to make. Thank you so much . 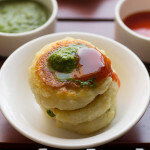 Thanks Rhea, do try the whole wheat nankhatais and let us know how it was? thanks for positive views and kind words 🙂 you are welcome. I also love wheat nankhatais.